What are the discussions about 'Fixed-Term Parliaments Bill' in UK political arena? This documentation features the transcripts of the unabridged speeches held in the UK Parliament from the Temporary Chair (Mr David Amess), the Second Deputy Chairman of Ways and Means (Dawn Primarolo), the Parliamentary Secretary, Cabinet Office (Mr Mark Harper) and other MPs' of the UK Parliament. 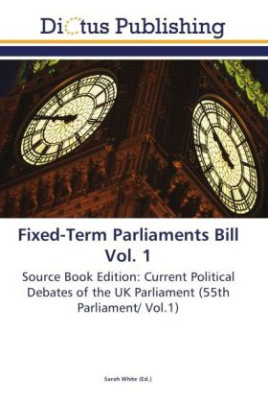 This non-partisan documentation offers the reader a direct glance at the parliamentary debate on 'Fixed-Term Parliaments Bill' and the discussions of the Parliamentary members in relation to the political agenda.